It’s like magic – insert a cancer patient’s blood cells in one end and out the other end come T-cells adapted for cell therapy. But it’s not magic – it’s a very real and very promising way of making sure that the materials exist to better treat patients with cancer using immunotherapy. It’s a natural progression in the innovation process, says Dr. Jonathan Bramson of McMaster University. First come innovations in technology – in this case, a new way of treating cancer from the inside, using a patient’s own immune cells. These innovations in turn drive innovations in manufacturing. Right now, the method for producing T-cells is costly, labour- and space-intensive, and open to contamination. T-cells are grown first in a test tube, then transferred to a small flask, then to a larger flask and so on. At each stage, the nutrients the cells need have to be added. The process requires skilled technicians operating in a sterile laboratory space to prevent any contamination. The process has to be repeated for each patient, at a cost estimated at about $500,000 for one round of therapy. Most research and private-sector investment have, to date, focused primarily on clinical development, testing the use of the cells for their ability to treat cancer successfully. But with all the progress being made in the clinic, the need for a more cost-effective way of producing the necessary T-cells is becoming a greater hurdle. In the words of Dr. Bramson, “the current way of doing it is not a very legitimate long-term choice.” It’s time to catch the manufacturing up with the technology. Dr. Bramson, a professor of molecular medicine, has teamed up with chemical engineer Dr. Raja Ghosh, also of McMaster, to do just that. Their goal is to make sure that the high cost of manufacturing cells doesn’t prevent cell therapy from becoming mainstream. 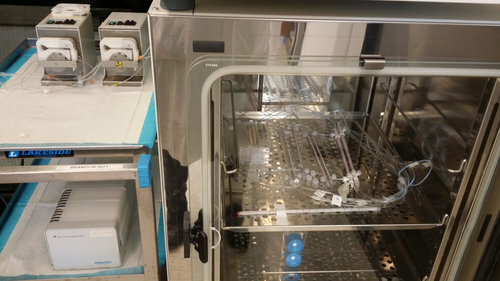 Pictured above is the “bioreactor in a box”, a three-foot closed cubed system that operates without human interventions. They are developing a “bioreactor in a box” that will create T-cells in large numbers where they are needed. No need for skilled technicians, no need for large, sterile laboratories, no need to transport cells from lab to clinic – and a giant reduction in costs, to boot. In addition, says Dr. Ghosh, the bioreactor more closely mimics the natural environment in which T-cells normally grow, meaning they will grow better. Rather than having to add nutrients manually, as is the case under current conditions, with the bioreactor in a box, porous hollow fibre membranes run through it, picking up nutrients at one end and pushing out depleted material from the other side. All this happens without having to open the box at all, reducing the need for personnel and the risk of contamination and improving the quality of the end product. Dr. Bramson likens it to a casserole – put in all the ingredients, put the cover on, stick it in the oven and let it cook till its done. “We want [the T-cells] to always be fed and happy,” says Dr. Bramson. The other thing the bioreactor in a box does, adds Dr. Ghosh, is remove the products of metabolism, such as carbon dioxide (like humans, cells “inhale” oxygen and “exhale” carbon dioxide) and toxic metabolites – things that can hinder the growth of T-cells. The bioreactor isn’t quite ready for prime time yet. Drs. Bramson and Ghosh are still working to scale up the box so that it can “multiplex,” producing several cell cultures at the same time by making the box itself larger rather than just using additional boxes side by side. It’s proving a challenge, as feeding and growing T-cells operates differently in a different-sized box. The cells are further away from the hollow tubes, so right now don’t grow and thrive as well. Understanding the dynamics of a larger vessel is the current challenge. Dr. Ghosh notes that the project is still in the early to mid-phase of development. They are not ready for clinical trials, but they have data to show the ability to generate T-cells for clinical use that meet stringent quality standards. And they are in discussions with private-sector companies to move the bioreactor in a box closer to clinical use. And when that happens, says Dr. Bramson, “this could be transformative,” not just for cancer treatment, but for other diseases, such as auto-immune diseases, as well as for other cell populations that need to be adapted for use in treatment.